The band is Keizo Matsuo on guitar, harp and vocals, Masafumi “Marya” Koyama on guitar and Zony on drums. 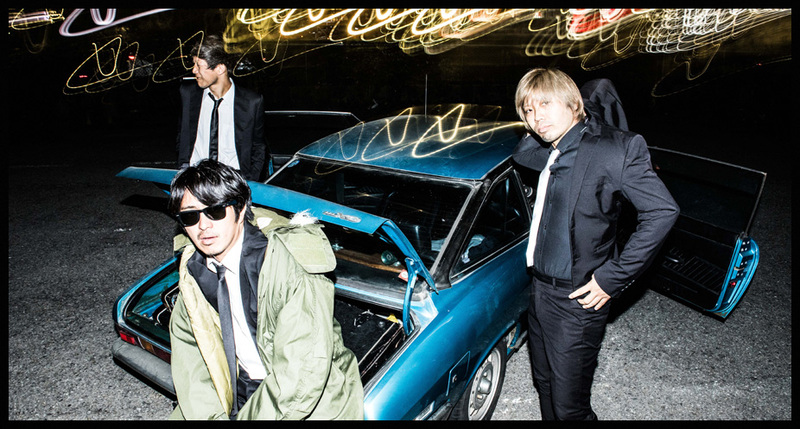 The band came together in 1997 and has proved one of Japan’s most durable rock outfits, backing the likes of Jon Spencer, the White Stripes and Strokes in their tours of the country. The NYC connection goes further as it was Jon Spencer who produced earlier albums and Matt Verta-Ray who recorded those same albums. Their self-titled debut album hit the streets in 1998. The band made its major label debut in Japan on Toshiba EMI in 2001 before they sign to “In The Red” the same year. This two guitar and drums trio cramps toxic punk rock, barbed-wire blues and wrestled with fuzzed-out noise. It’s no surprise that the King Brothers live shows get attention. Taking to the stage dressed in what have become their trade mark black and white suits, the three piece who hails from Nishinomiya City, Japan appear amaze audiences with their insanely energetic stage act. Within a matter of seconds all hell breaks loose as they burst into life; a cacophony of guitars, vocals and drums smashing into the fans at full tilt. The King Brothers are known as the most dangerous act in Japan, having had themselves banned from nearly every club in Osaka for destroying property. «If Jon Spencer took roots rock ’n’ roll and deconstructed it, then Nishinomiya’s King Brothers threw it against a wall and left it there bleeding». «Definitely the best band in the world». «Few live acts make me drop my beer… I lost my Schlitz when I raised my hands in glee at the coccyx-crunching, psycho-blues racket produced by these three polite maniacs from Nishinomiya City». «Wasteland bangs like you blow up a bank vault».